Hope you can join us at our next concert on 17th November, 2018! GDPR is an important change in government legislation regarding data protection and stands for The General Data Protect ion Regulation. It effectively provides an update to the Data Protection Act, bringing in new requirements and increasing the penalties for breaches. When young people apply for membership of ‘Singing Futures’ they complete an application form. In doing this they give us personal data: their name, address and the name of their parent/carer, an email address, any important medical information and finally emergency contact details. These forms are secured and deleted when the young people leave the choir. A member of the Singing Futures committee makes a register of those attending the session. Members and their parents’ and/or carers’ personal data is stored in a folder and password-protected database accessible only by the Singing Futures committee. Members’ emergency contact details are available, via a folder containing application forms, only to members of the committee who are actively involved in Singing Futures’ rehearsals or performances. The data is maintained at least twice annually and is used only for the purpose for which it is collected. Monitor numbers attending so we can ensure the safety of the young people and plan future sessions and concerts (i.e. try to ensure sufficient numbers of helpers are available according to numbers participating and to make decisions about the viability of concerts). Alert emergency contact(s) if we have concerns about the welfare of the young people in our care. Take appropriate care of young people with special medical needs. Contact you with important choir updates/newsletters, safety and safeguarding information and membership renewals. Help us plan for future choir rehearsals and events. Photographs are sometimes taken at Singing Futures rehearsals or concerts. The photographs are used by the committee on the Singing Futures website and for on publicity and promotion. If you are unhappy about the use of your data or photographs as described in this statement please notify any of the Committee with your concerns. We’d like to say a huge “well done!” to all Singing Futures young people for Saturday’s Music Hall performance in November, 2017. You were all real stars! Also, we raised over £400 for Children in Need, so thank you to all the adults too! Follow the link to see a report on a Singing Futures in the Lowestoft Journal. 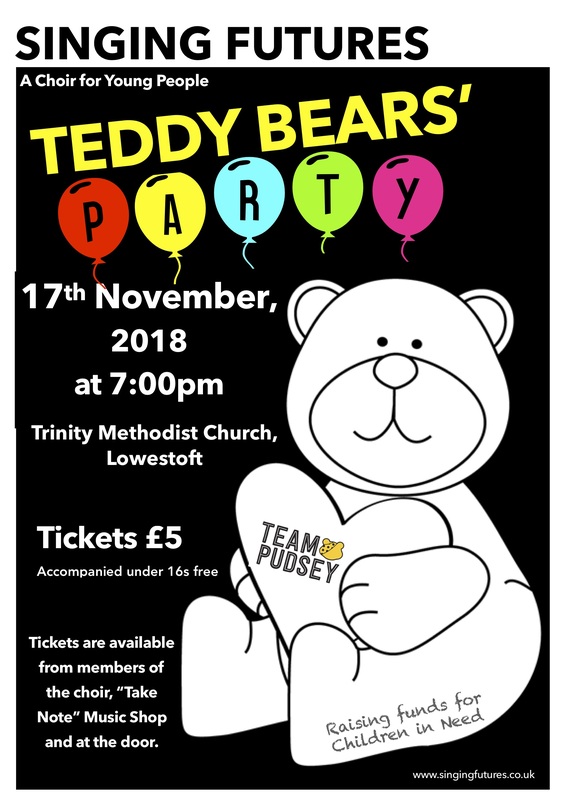 Our next concert at Trinity Methodist Church, Lowestoft is on November 17 – Teddy Bears’ Party.